UVA aerospace engineering student and Mission Manager Erin Puckette (center) prepares for upcoming launch. With her are team leaders Kim Wright of Old Dominion Univ. (left), and Madison Brodnax of Virginia Tech (right). This week’s scheduled Antares launch at Wallops Island will carry space satellites engineered and built by Virginia university students.The satellites will rendezvous with the International Space Station, be released by the astronauts and orbit for up to two years. WCVE’s Charles Fishburne reports. 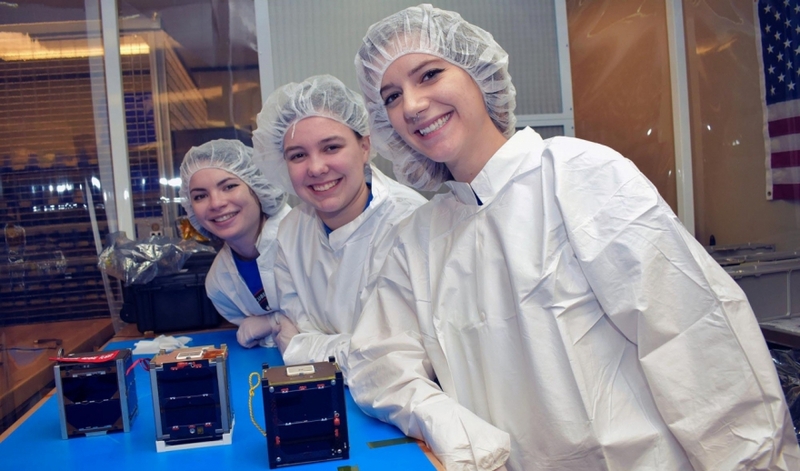 For three years, 140 students from The University of Virginia, Virginia Tech and Old Dominion University have been designing and building three small satellites that are now ready for launch. Erin Puckette: It will be exciting to see the spacecraft finally on its way to where it will spend the rest of its life. Erin Puckette has been studying aerospace and mechanical engineering at UVA for four years, but was surprised to find her real strength was team leader. Puckette: I sort of worked with the team of engineers and they were the ones who did the actual building and testing of it. I just made sure they had what they needed to build it. What they needed were parts to withstand the challenges of space. Trace LaCour: You could go and get regular resistors, regular capacitors, a regular radio. Fourth engineering student Trace LaCour helped design and build the electrical system. LaCour: It might work, but you can’t take any chances, because if you are trying to send data back down to the earth, and your radio doesn’t work, well, that’s it. LaCour’s radio will send back digital signals from space, from a tiny satellite. Christopher Goyne: A CubeSat is a small spacecraft, it’s about four inches cubed. UVA’s Christopher Goyne, Associate Professor of Mechanical and Aerospace Engineering says the form factor has become universal. Goyne: The idea is to make it sort of cheap enough for university students to be involved. Over one thousand CubeSats have been launched in the last 20 years. But Mary Sandy says their project is unique. She’s Director of the Virginia Space Grant Consortium, a coalition that includes five state colleges and universities and NASA. Mary Sandy: The satellites will ultimately be deployed into orbit by astronauts aboard the International Space Station nearly simultaneously, so they can orbit together and function as a constellation. She says as the orbits decay due to atmospheric drag, satellite instruments will quantify atmospheric density. Goyne: Yeah, it affects the lifetime of the spacecraft, how long it is in orbit. Goyne says this information is critical to NASA. Goyne: It also affects how much fuel you have to take with you to maintain that orbit and to overcome that drag from the atmosphere. Sandy says engaging students in real-world space missions like this provides exciting educational opportunities and critical workplace skills. Sandy: By taking on actual mission roles and going through NASA design and flight readiness review, students are learning how space missions are done and how to deal with the unique challenges of the space environment. Puckette: I think to be good engineers and good scientists and ultimately good people, you sort of have to learn to push through the failures and get back up and run at it again or run at it differently, and that’s what we did and that’s how we made it where we are today. It wasn’t because we were the smartest in the room necessarily, or because we always knew exactly what we were doing, but it was the tenacity to get this done and to see the satellite launched into space. The launch of the Virginia students’ satellite is scheduled for Wednesday. Charles Fishburne, WCVE News.